During this time of year, I enjoy hanging out in the kitchen often, cooking up wholesome dishes like soups and stews made from my homemade bone stocks. Homemade bone stocks are made from the bones of beef or poultry. The bones from these meats are simmered for up to 24 hours to produce a healing and flavorful broth. This healing and warming broth can then be used to make soups and stews, and other foods requiring water to cook. Soups and stews can be easily started in the morning hours in a slow cooker, and enjoyed by dinner time. My family enjoys these slow-cooking dishes with a side of salad or steamed vegetables. Soups and stews are a regular in my family-at least once-a-week. Here are some great dishes that can be enjoyed by your family during the winter months, when hanging out in the kitchen is not a chore as much as it can be, cooking in the summer months. 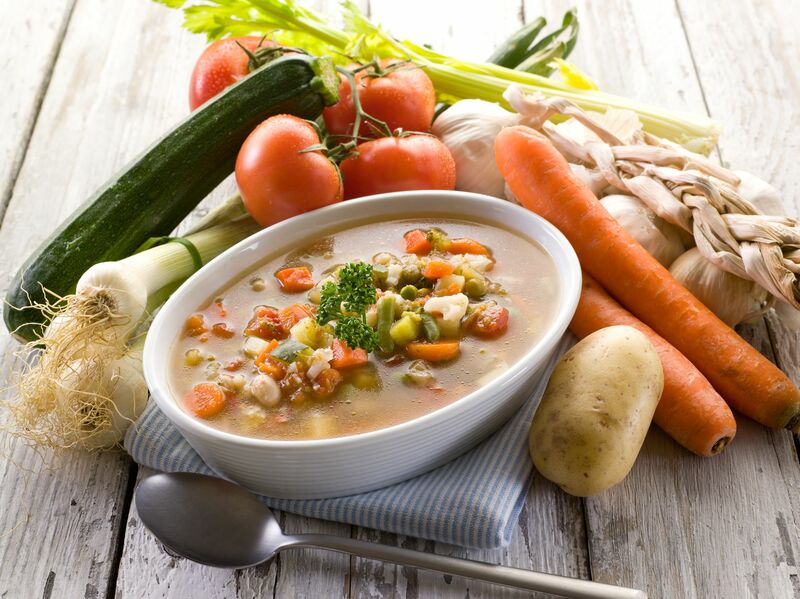 Best known as the “medicine” for the winter cold, this is a great choice, as stews are loaded with wholesome vegetables! Giving you that anti-oxidant protection needed to keep your immunity up. Beef stew can aid in winter colds and flu viruses. They’re not a lot of work to prepare either. Simply add the ingredients to a slow cooker first thing in the morning, and dinner is served by 5:00 pm! Oxtail is also known as the Cow’s tail. The fat, cartilage, and bone marrow give an abundance of flavor to oxtail stew. When cooked for a long period of time, the meat becomes very tender and can be enjoyed during the cold winter months. This is my most favorite of the stews I enjoy making during the winter months. My family enjoys the flavor of the tender meat so much that I have to make a large batch of this stew to be enjoyed days after it’s cooked. I grew up eating chicken & noodle soup. It was always the soup of choice whenever we would get a cold. This soup is a great dish to eat when fighting a cold during the cold/flu season. It’s loaded with nutrients and vegetables to keep you feeling warm while aiding with the healing process. So the next time your’re feeling “under-the-weather”, have a bowl of chicken & noodle soup! Lentils are loaded with nutrition. They’re high in fiber, lean protein and iron. The Centers for Disease Control and Prevention reports that eating plenty of nutrient-dense foods like lentils can lessen your risk of many serious medical problems. They’re very easy to prepare and don’t require long soaking time like beans. Rich in folate and iron, they’re a great choice of beans that require less cooking time. I hope you will try these soups and stews as warming foods, and add them to your menu of winter foods you enjoy cooking, to help with cold/flu season. What’s your favorite warming winter food?